Ah, another week of freedom! I know I’ll regret taking so many weeks off later when I’ll have no vacation left. But ah, currently, I can’t complain. I started this week by going on a little trip to Düsseldorf with a friend. I don’t live far from there but it’s an expensive city and usually, I spare myself the anger. But apart from the crazy-expensive car parks and the crowded old town, I really love the city. I don’t even know why I don’t brave the place more often. Probably because it’s hard not to feel unworthy. The city is just packed with wealthy people who look perfect, talk perfect and act perfect. Although that might just be my POV. Still, it’s hard not to feel humble in the presence of so much luxury and money. We started by taking a mini trip around the city in search of a cheap / free place to park the car. Lucky as we were, we found a spot right next to a subway station so it took us only a few minutes before we emerged right into the city center. First stop: A department store where I dug out a 10% off coupon (unforgivable in a place like Düsseldorf, I had to learn) and finally bought one of Clinique’s Chubby Stick Intense. I’d been ogling them for a couple days now and had been ready to buy one in Oberhausen the other day but the color I wanted was out and I just cannot make myself buy a brownish lipstick, I’m sorry. Buying it in Düsseldorf turned out to be not very smart because even with the 10% off it was more expensive than in some places on the Internet but aaaah well, I had spent money and it gave me that nice warm feeling of being decadent. Afterwards, we joined the crowds outside and went on a walk around the old town. Actually, we’d meant to go and grab some food but that turned into a longer walk because my friend is…let’s say not very adventurous. I had meant to try some of the exotic food places you find in Düsseldorf. It is well-known for its large Asian population and there are supposed to be a lot of fantastic Chinese, Japanese and Thai places. But my friend…let’s just say she’s the only person I know who would not be tempted to slit her wrist if she was told that she could only have one dish every single day for the rest of her life. She hardly ever tries something new and what she does eat is usually something safe and approved by generations of her family. So after we’d walked around the city and I’d pointed out a couple places, she finally came right out and suggested that we should just go to Pizza Hut. How exciting. Not. But ah well, by that, I was starving and freezing and not in the mood to argue the point. I did need a small victory, though, so I insisted we go to Sugarbird to get some cupcakes to go as a treat for after lunch. The adventure continued after lunch when my friend dragged me to the QVC outlet. QVC! Me! I was trying to make an excuse for not going inside but couldn’t come up with one. So I let her drag me inside. At first, it was the horror I’d expected. Kitsch and trash everywhere. Giant plastic bushes for the yard, ugly fleece blankets and royal blue floor length velvet dresses! But then we got to the cosmetics department. Have you ever had to force yourself to suppress the horribly high-pitched scream that’s trying to escape you in a very public place? They had Bare Minerals products for a very low price. It wasn’t very glamourous, mind you. Powders, blushes, primers, brushes…all put together in seemingly random collections and in sealed plastic bags. And all of them were returns because people didn’t like the colors or couldn’t pay for them after all. But I’d been ogling Bare Minerals for a while but the price always put me off. 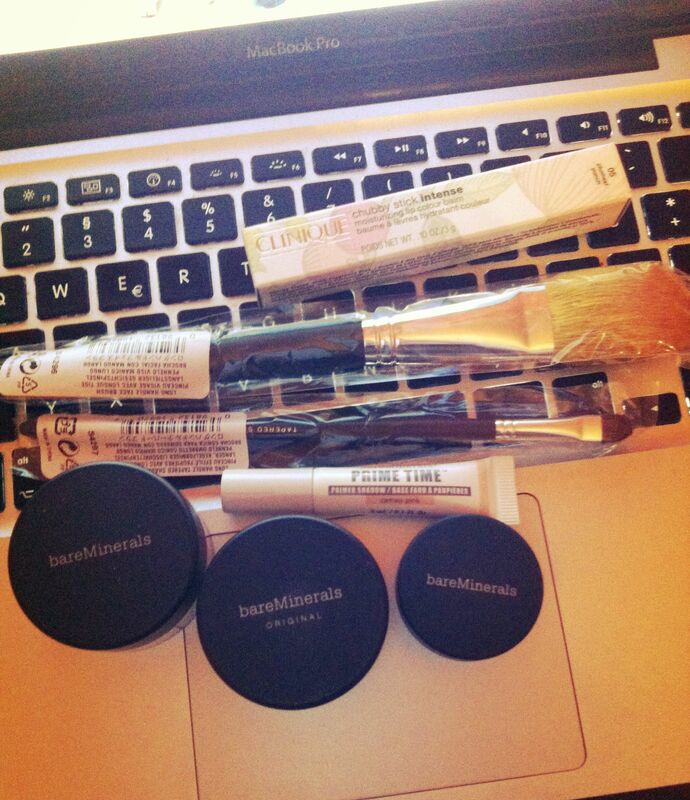 Now I got face powder, mineral blush, mineral eye shadow, tinted primer and two brushes for 14.00 €. And one of the brushes is even a kind I don’t own yet but had been meaning to buy for a while. I would have bought more but my friend assured me they always have whole mountains of BM for sale so I decided to try these and come back for more if I like them. Feeling accomplished after I’d done some more beauty shopping, I then insisted we go back to the car before I spent more money. And so we did. But we didn’t leave Düsseldorf before getting to another little highlight for us. A couple days back, the first Starbucks Drive Thru in Germany opened in Düsseldorf. What’s probably part of everyday life for a lot of US citizens is exciting for us. Feeding your caffeine addiction without leaving the car…that’s genius! So we got there and I have to admit the place was still a bit of a mess. Things take longer than they should because everyone’s still learning. But we engaged in some small talk with the very sweet and charismatic employee and so the wait was alright. Because we’d been patient or nice or maybe just because we were customers, he even handed us two vouchers for free drinks. Which I’m not even sorry to say we spent right when we got back to Oberhausen. 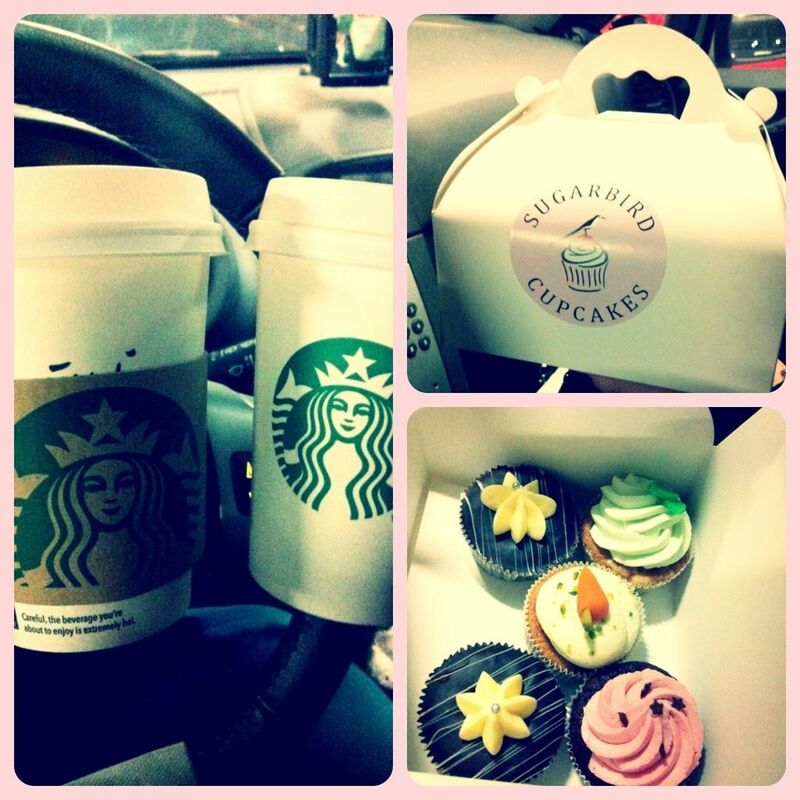 So with our second caffeinated drinks of the night, we also finally enjoyed our cupcakes. My friend insisted we go catch a movie the end the day but I was simply too tired and just wanted to change into my sweatpants and zone out in front of the television. Today, I woke around noon and didn’t quite know what to do with this day. I decided I was gonna go to the gym but as soon as I sat up in bed, I was met with a pounding headache so my resolution started to crumble quite quickly. Then I made myself some light but yummy breakfast and decided I was gonna do some more cleaning. So I called my mom and begged her to bring me her vacuum cleaner. No, I do not own one myself! I used to but I only have one room with a carpet, my bedroom, and there are about two square meters of space that I can access so when my vacuum cleaner died, I must admit I simply didn’t want to spend the money on a new one. Especially when my mother owns one of those incredibly expensive huge industrial ones. So I borrow hers every couple weeks. I was gonna do that today but while we were sitting down with a mug of coffee, and I was trying to remind myself of why I thought cleaning was such a good idea, my phone vibrated with a message from a friend. “I’m at the mall. Wanna meet for coffee?” Now, if you know me, you’ll know that nothing and no one can keep me from having coffee at Starbucks. So instead of cleaning, I got dressed and headed out to meet her. What she hadn’t told me, however, was that it was an Open Sunday. In Germany, stores are closed on Sundays, safe for a few throughout the year when certain malls and city center-located stores are open. Yes, it’s one day a week and people could easily go do their shopping any other day. But they don’t. So on those days, complete and utter insanity occurs. It took me a while to get into the car park but once inside, finding a free lot was surprisingly easy. So I found my friend and was quickly soothed by a wonderful Tall Soy Vanilla Latte. I’m not the person who has her favorites and never budges. In fact, I have something else almost every single time. But Vanilla Latte and Chai Tea Latte are my personal idea of heaven. Soy, if possible, but lactose free can be tolerated. And then, what can I say, the temptation got too strong and we indulged in some retail therapy. I think no one was more surprised than me when I was the one who bought almost nothing. I only got some fabric softener from the drug store, a ridiculously cheap new eyeliner brush and an equally cheap bottle of nail polish top coat. A word of advice from me: Do not buy the crazy expensive Good to Go one by essie! At 8 € the bottle (the German range is a bit cheaper than the original US one), it performs really well when you use it the first five or six times, then it gets all gooey and sticky and can hardly be used anymore. Not a fan, I’m sorry. So now I got a cheap 1.49 € one by p2 and hope it’ll be better. I’ve heard only good things about it so far. Even though we also went to the new Thalia bookstore, I didn’t buy anything. But I’ve once again been reminded of how many books I still absolutely have to read. Pretty much John Green’s entire bibliography, as well as Walter Moers’, then “2012” by Brian D’Amato, a couple of the crime novels by Claude Izner… I could just go on and on. Oh, the many, many books I held in my hand today and wanted to take home! As well as the many Yankee Candles that I sniffed and wanted to buy. If you’ve never had one in your home, go buy one, now! I personally prefer the tarts but the house warmers, though expensive, are just as good. My current personal favorite is Mango Peach Salsa. So fruity and fresh. But Kitchen Spice made my mouth water, too. I think I can see a large order of several Yankee tarts coming my way soon. Apart from spending a spontaneous day out with a friend, I’m really popular these days. What happened? Usually, I’m more of a hermit. Sometimes, I think I’m the moodiest and broodiest person of the world. Or I used to think so. I still like solitude, spending time with myself. I don’t even mind sitting in Starbucks with a book or even going to concerts on my own. But ever since my former closest friend and I parted ways, I also feel a lot more light-hearted about myself, friends, relationships. As if we’d dragged each other down or, without putting any blame here, I let them make me believe that I was such a downer of a person. When really, I’m not. I may have been with them, although that definitely went both ways, but actually, I am the kind of person you can just sit down and have a coffee and light conversation with. And lately, it seems that people seem to agree with that. Planning meetings used to be such a drag with planning weeks in advance. Now I get random texts from people asking if I wanna do this and that today or tomorrow and it’s just…nice. I still get down days when I prefer to be alone and I admit that large group outings are still a nightmare for me. But I definitely do a lot more these days. For my birthday, since I’m turning 30, I’m even planning a little experiment. I asked two of my friends if they’d like to do something with me the day after my birthday. I just can’t bring myself to cancel the annual birthday dinner I have with my mom. She’s always been here for me and we’re so close so it doesn’t feel like I’m putting friends after my mother but just like I’m choosing my oldest and closest friend over any other plans. It only seems fair. It would make me feel bad to tell her that I’d prefer doing things with others on my actual birthday. She says she wouldn’t mind but it’d feel wrong to me. As I said, it’s not only a classic mother-daughter-relationship so these things never felt like cracking my egg shell and leaving the nest but more like ditching a friend. Plus, this way I get to celebrate my birthday for two days in a row. Go me! 😉 I’m just nervous about these two friends not knowing each other. They’re both some of the nicest people in the world. One is really light-hearted and easygoing, the other is extremely openminded and warm-hearted, so I know I shouldn’t worry. I’ve just made such bad experiences with introducing friends to each other. Admittedly, they were all difficult to handle and downright rude and stubborn to each other but it’s made me nervous now. Let’s just hope my after-birthday won’t end up being a complete disaster.